If a person has silver or amalgam fillings, you know it, because as soon as they laugh or talk, you can easily see the dark gray streaks running along their teeth. Of course, if you have some, you probably think about them whenever you meet someone new as well. They might have been able to repair your teeth, but dentistry has basically made them obsolete now. Here are 3 reasons why it’s important for you to replace your old metal fillings from Dr. Masha Kogan, your dentist in Westport. 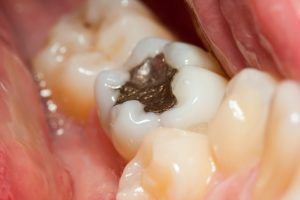 The substance used to make many fillings is called amalgam, which as the named suggests, is made up of a variety of metals including copper, silver, tin, and mercury. If that last one stuck out to you, it should. Mercury is extremely toxic, and exposure to it can cause a wide array of neurological problems and physical ailments such as tremors, migraines, and memory loss. Previously, it was believed that once mercury was in a filling, it simply stayed there. In actuality, every time the filling comes into contact with other teeth (like when you chew), mercury vapor is created in your mouth, and can easily get into your bloodstream, which can suppress your immune system. People who tend to unconsciously grind their teeth are especially at risk for this. This mercury vapor is also created whenever a person brushes their teeth, meaning that millions of Americans are exposing themselves to it at least twice a day, every day. The malleability and low cost of amalgam made it ideal for dentistry in the past, but over the last 20 years as more research has been done, more conscious doctors and patients are now choosing to avoid it to eliminate all the risks of potential mercury poisoning. One of the main drawbacks of amalgam fillings is that the substance doesn’t actually bond to your tooth enamel. They have to sit in a pocket created by removing portions of your tooth, which weakens the tooth’s structure and makes it much more likely to crack. Also, due to the metal, teeth can become sensitive to heat and cold, making it uncomfortable for people to eat a variety of foods. It is also very common for the amalgam to corrode away from the edges of your tooth, which can lead to it decaying from the inside. This can be very hard to spot, and has a much higher likelihood of damaging the sensitive nerve of the tooth, which may cause a person to need a root canal, or have the tooth extracted altogether. Like we just touched on, metal fillings stick out quite a bit in your smile. They are a much different color than your natural enamel, and it’s almost impossible not to notice them when talking to someone. They can easily make you feel self-conscious, which may make you hesitate to start a conversation or meet someone new. What Do I Replace Them With? The composite resin can be specially shaded to match the rest of your teeth so that it seamlessly blends into your smile. The substance itself is plastic-based, and contains none of the dangerous materials (including mercury) that are present in amalgam fillings. It is also better at restoring your teeth, as the resin can firmly bond with the surrounding enamel. This means your dentist only needs to remove the damaged portion of your tooth, leaving the rest intact and stronger. You’re left with a tooth that looks better, is biocompatible, and can be relied on day to day. Amalgam fillings might have been the best way to restore your teeth in the past, but that is no longer the case. Tooth-colored fillings provide better results in every way possible, and your cosmetic dentist in Westport is more than happy to use them to replace your old fillings and restore your smile. If you have any questions about tooth-colored fillings, or are ready to have your old ones removed, give us a call today.